In addition to the two Red Cross citations awarded Miss Grace Roberts, as described in last week’s column, there is still another one, given in February, 1945. On this occasion, Miss Roberts was a special guest of honor, at a luncheon given at the Philadelphia Headquarters of the Southeastern Chapter, American Red Cross, to mark the 28th anniversary of the opening of the production workrooms in the Chapter. Since Miss Roberts had been in the Production Corps of Red Cross since 1917, it also marked a 28th anniversary for her. Even before that eventful date of April 6, 1917, when the United States entered World War I, Miss Roberts was active in community service work. In 1915 she was chairman of the Neighborhood League’s Harvest Home Fete, given on the Charles S. Walton estate in St. Davids, which cleared over $4,000 for the local relief work of that organization. Later, the Wayne Needlework Guild gave her charge of packing boxes for the needy of Europe. A clipping from a June, 1915, issue of “The Suburban,” preserved among Miss Roberts’ mementos, shows that a total of 4,975 articles had been shipped to Europe over a period of the previous four months. Made by the willing hands of many workers in Wayne, this list comprised such articles as fracture pillows, rolled bandages, slings and knitted sponges and abdominal bandages, crutch pads, surgical shirts and many other articles to be used in army hospitals abroad. This work for Europe’s hospitalized in the first World War was but a prelude to what was done when the United States had entered the conflict in April, 1917. Among Miss Roberts’ most vivid memories are those of the first headquarters, established in the summer of 1916, in a ground floor apartment of what had once been the Pinkerton family home, on the southeast corner of Lancaster and Louella avenues. With volunteers in charge, these rooms were open every morning and afternoon for the enrollment of Red Cross members, and public meetings were held monthly. Among the volunteers in charge were Mrs. Henry Smaltz, Mrs. T.T. Watson, Miss Marion Mulford, Mrs. Robert G. Wilson, Mrs. William V. Alexander, Mrs. Wm. Henry Brooks and Miss Roberts. In addition to rolling bandages, which was the first class to be started by the new branch, instruction in first aid was offered. Within two months these first headquarters were outgrown. Larger quarters were obtained on the floor of the house at 105 East Lancaster avenue, then occupied as both office and residence by Dr. A.H. O’Neal. This house had been known for many years as the home of Mr. and Mrs. John H. Cook, old time residents of Wayne. Soon still larger quarters were needed and in January, 1918, the branch moved to the Bonniwell house at 120 West Lancaster avenue. Not only is 40 years of continuous service in Red Cross a record in itself, but in the case of Miss Grace C. Roberts, that record is augmented by several other factors. She was one of the eight women who were present at the meeting held on July 3, 1916, for the organization of the Wayne Branch of the American Red Cross, as told in last week’s column, held by order of President Taft, as part of the reorganization of the National Red Cross Society, so that this group might be prepared to do its part at home and abroad in World War I. At that meeting, Miss Roberts acted as secretary pro tem. At the next meeting, held a week later, she was elected corresponding secretary, an office which she was to hold continuously for the next 32 years. When she resigned from that position at the annual board meeting in January, 1948, she was named a director of the Board, an office which she still holds. The picture shown above was taken at this time. At the 1948 meeting, Mrs. Allen Hunter White, then Branch chairman, presented Miss Roberts with a leather bound portfolio, designed to hold the various citations Miss Roberts had received from the American Red Cross, and other data. Ornamenting the outside of the portfolio is a handpainted replica of the red, while and gold administration pin of the Red Cross, a pin that Miss Roberts has been entitled to wear ever since it became the official insignia of Red Cross office. The embossed page of dedication in the front of the book is signed by many of the guests present at the luncheon, held in Miss Roberts’ honor following the meeting. The first citation is one signed by Woodrow Wilson as president of the United States. It was given “In recognition of service faithfully performed in behalf of the nation and her men at war.” On it Charles J. Hatfield, then chairman of the Southeastern Chapter of the American Red Cross, certified that between April, 1917, and December, 1918, Miss Roberts had given 2,800 hours of service to the work of that organization. This was presented at the close of World War I, only about a month after Armistice Day, November 11, 1918. Benjamin Rush, Jr., chairman of the Southeastern Pennsylvania Chapter of the Red Cross, added his signature to that of President Truman and chairman O’Connor. These are but a few of the honors that Miss Roberts has received in the course of 40 years of Red Cross service. Others will be told in later columns. On Wednesday morning of this week, members of the Wayne Branch, American Red Cross, filled the large second floor assembly room of the Masonic Hall of Wayne Lodge on South Wayne avenue. All listened with interest to the reports of thousands of hours of work given in 1955 by Branch officers, chairmen and volunteers in various services and departments of one of the oldest branches of the National Red Cross to be organized in the State of Pennsylvania. The dates of the organization and subsequent activity of the Wayne Branch are closely connected with those of World War 1, while the date of its expanded activities in its new headquarters coincided with the beginning of the second World War. Back in 1916, Pennsylvania had had no representation in the National Red Cross Society until ex-President Taft, as chairman of its executive committee, determined to rouse more nation-wide interest in the organization. Pennsylvania at that time was being divided into sections for Red Cross purposes, as were many other states. Wayne became part of the large Southeastern Pennsylvania District, or Southeastern Chapter, as it is now called. At the request of Mr. Taft, local organization meetings were called throughout Pennsylvania. In Wayne, it took place on Monday afternoon, July 3, 1916, at the home of Mrs. C.C. Harrison, in Devon. In addition to the hostess, those present included Mrs. Charles S. Walton, Mrs. William A. Nichols, Mrs. William Paul Morris, Miss Mary L. Walsh, Mrs. T.T. Watson, Mrs. Robert G. Wilson and Miss Grace Roberts, all representative women of the Wayne area. At a subsequent meeting, officers were elected and plans made for the work of the branch. Officers included Mrs. William Henry Brooks as chairman; Mrs. C.C. Harrison, treasurer; Mrs. William V. Alexander, recording secretary and Miss Grace Roberts, corresponding secretary. Great emphasis was placed on the importance of local Red Cross enrollment, with annual dues set at $1.00. The use of a room in Radnor High School was granted for registration of new members. Mrs. Brooks, in her opening address to her group, asked that everyone register not only herself, but also carry with her at all times membership blanks for enrollment of others. 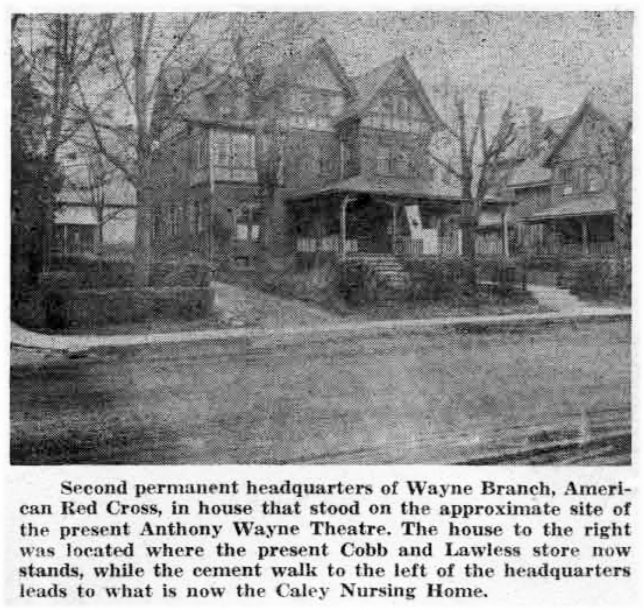 Thus was launched the first Red Cross membership drive in Wayne, the forerunner of many others to come. The value of immediate publicity being evident, Mrs. Louis Jaquette Palmer was named chairman of that committee. And then “as an initial step in practical work,” Mrs. Nichols invited everyone interested to meet at her house on the next Friday morning “to roll bandages,” initiating the work of making surgical dressings.